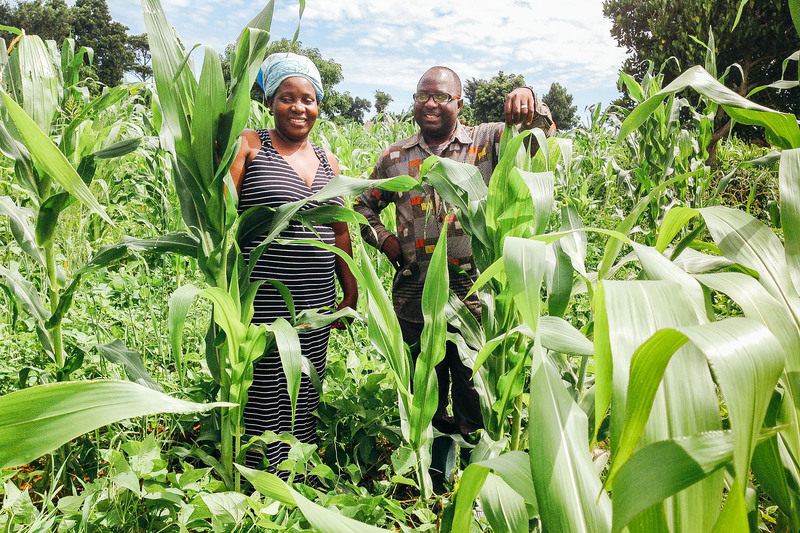 Photo: Our program directors Frank and Susan stand proudly among the new crops to show us how they’re coming along. 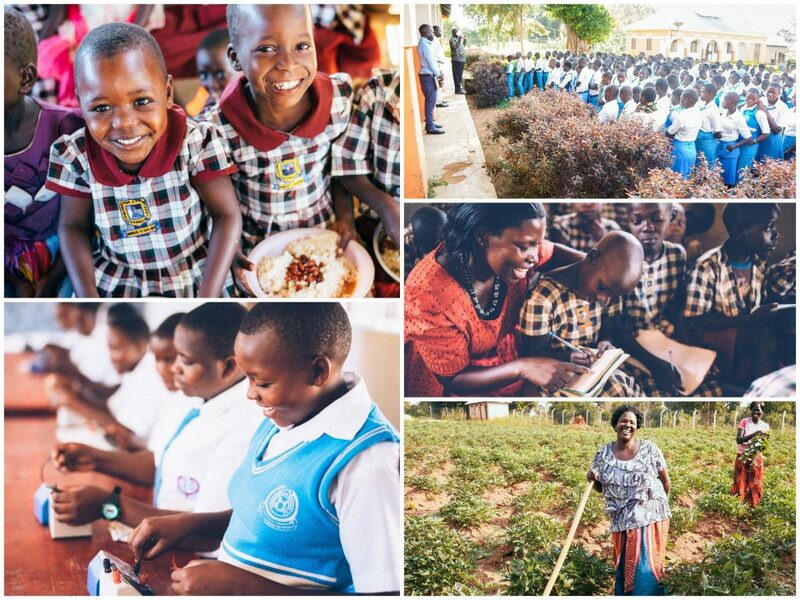 This week we bring you a report of empowerment and an effort to deepen sustainability in our rural Uganda education and orphan care programs. Thanks to the success of our boarding high school receiving the highest test scores in the Western Region of Uganda at the end of this past school year (February-December 2017) and the resulting publicity our school received, our enrollment is up to 370 at the high school and 300 at the rural primary school. And with more students enrolled comes an increased need for food. In realizing that our existing farmland is not enough to sustain the food supply needs for as many students as we now have, our native team has taken a resourceful approach to expanding the farmland’s output without creating any significant capital requirements: they are currently leasing 20 acres of nearby land to grow corn and beans, the most common staples in the Ugandan diet. The cost to lease the land is only $285 per month, and over a 4.5 month period of planting, maintaining, and then harvesting the crops, labor will come to about $1,000. In addition to these expenses, it costs $500 per growing season to utilize the appropriate pesticides. There are two growing seasons, and we expect good yields to come from both. In fact, if all goes according to plan, we can expect approximately 10 tons of food from the leased land per harvest. If we were to go into the market and buy this amount of food over the course of the school year, the cost would be an estimated $10,000. So as we have looked at our calculations, we project that the profitability (in savings) of leasing the land and growing these additional crops should be roughly $6,790 per harvest, after costs. We’re proud of our native team for being innovative and resourceful in working hard to grow their own food instead of just sitting back waiting for handouts– they saw the increased need for food for their students, and so rather than waiting on funding to buy more food, they’re actually getting out there and growing it. The first crops have been planted, and as you can see from the lead photo, they’re already well underway. Our native team launched our current high school over a decade ago under very humble conditions. The school was a seed of faith, consisting only of a humble shed-like building with dirt floors and simple benches for the students to sit on. Over the years, thanks to the generous support of our donors, we have slowly improved the school to bring it to the developed status it enjoys in today. The school now consists of five permanent buildings including a girls dormitory, two extensive classroom buildings, a faculty office building, an on-campus clinic, and a canteen. In 2016, after much hard work on behalf of our diligent high school administration, the school received its formal accreditation from the government. The status is very difficult to achieve and it is especially noteworthy for a school in such a remote location of Uganda to reach this goal. This prompted a visit from the president of Uganda himself to congratulate our staff and all the students for their hard work. Yet with all of these accolades and achievements of our hard-working faculty, we still have a few more critical steps to take to elevate the school to the level necessary to compete with the larger city-based boarding high schools. It’s our desire to equip the orphans and underprivileged rural students of our region with an education that can help them compete in a global marketplace. Thus we are seeking $12,000 for a set of 50 refurbished laptops to create an up-to-date computer lab for the students. Unfortunately, the small lab we had in place is now obsolete due to the hardware becoming far out of date. Facing many maintenance issues, it was simply no longer supportable. We are also seeking to make improvements and further expansion of the facilities. Unfortunately, an excessive amount of water flow from the roofs of the existing school buildings is starting to erode their foundations. Yet if we can capture this rainwater to harvest it, we could store it and use it for the students’ washing needs, and at the same time protect the building foundations to stay dry and firm. Thus we need to purchase 5 water tanks of a capacity of 20,000 liters each at a cost of $1,800. And for a “dream reach” goal, we have a larger capital need we are praying for. Currently, our boarding boy scholars are sleeping in makeshift arrangements in classroom spaces. We would like to provide them with better sleeping quarters in their own dormitory. This would simultaneously free up needed classroom space. The land is available. We just need the funds to enable this next step in the master plan of the campus. The financial goal is $45,000 to complete the structure. Thank you for reading this important update from our rural Uganda programs. Together with your generous support, we are making a difference in the lives of orphans and at-risk youth who would otherwise have a very slim chance of breaking out of the cycle of extreme poverty that plagues Uganda.